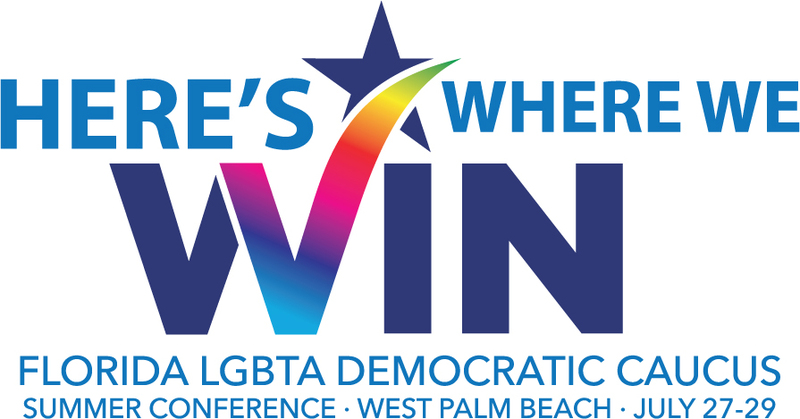 GAINESVILLE — The Florida LGBTA Democratic Caucus, representing the lesbian, gay, bisexual and transgender community to the Florida Democratic Party, announces the agenda for Here’s Where We Win: The Summer Conference, taking place July 27 through 29 in West Palm Beach. The conference brings together Democratic LGBTA activists from around the state for candidate meetings, election training, and presentations on major issues facing Florida voters. All conference events will be held at the Hilton Palm Beach Airport Hotel, 150 Australian Ave., West Palm Beach, except as otherwise noted. The conference features a Welcome Reception on Friday, July 27; a full day of conference meetings and presentations and a Leadership Dinner on Saturday, July 28; and a Farewell Brunch on Sunday, July 29. The Caucus will also host a Membership Meeting to consider endorsements for statewide candidates and amendments. Conference registration is $25 and includes the Welcome Reception on Friday; and continental breakfast, lunch and snacks on Saturday. The Leadership Dinner is a separately-ticketed event for $75. In addition, rooms are still available in the Caucus’ hotel block at the rate of $109 per night.